Professor Dr. Satoshi Omura graduated from Yamanashi University in 1958 and received M.S. and Ph.D. (Chemistry) from Science University of Tokyo. He also received Ph.D. (Pharmacy) from University of Tokyo. 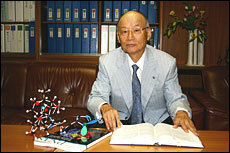 Dr. Satoshi Omura is the Professor and President of the Kitasato Institute. His main research is newly isolation and discovery of a great number of useful microorganisms and biologically active substances produced by them. And his major feature exists in the thinking and the definite technique for getting these results. By establishing original screening methods and ordering about them, in addition to improving isolation and cultivation methods of microorganisms, he has found over 120 kinds of new compounds and brought interesting results such as effective usage of the metabolites. Of these bio-active substances, avermectin, nanaomycin, rokitamycin and tilmicosin have been used in world-wide as medicines, drugs for animal use or agrochemicals. Staurosporine (a general inhibitor of protein kinases), triacsin (an inhibitor of acyl-CoA synthetase), herbimycin (an inhibitor of tyrosine kinase A) and cerulenin (an inhibitor of fatty acid and “polyketide” synthetases) have been widely used as exceedingly useful reagents and greatly contributed for development of biochemical and molecular biological researches. Motilide (a stimulating agent for gastrointestinal motor), frenolicin B (an anti-coccidium antibiotic) and lactacystin (an inhibitor of proteasome function) are now attracting attention as expected substances for a medicine, a drug for animal use, or an useful reagent in life sciences, respectively. Avermectin was found by collaboration established by Dr. Ornura with a reseach group of Merck & Co., Inc as an antiparasitic agent in animal. The antibiotic has contributed to increase production of foods, including beef, pork, vegatables etc, by its activities, insectcidal and antinematodal activities and has kept the top seat for the amount of its consumption, since 1983. Moreover, “ivermectin” a derivative of avermectin is a specific medicine for onchocersiasis, of which patients is presumed to be 20 million persons, and of these 400 thousand of patients have become blind. At present WHO is performing a large scale plannig for exterminating of the disease by using invermectin which has been donated from Merck Co., Inc. It was reported that 14 million persons could avoid from this infectious disease in 1995. Therefore, discovery of this antibiotic is highly estimated as the greatest achievement in the field of medicinal biotechnology in the quarter of this century. It is not too say that such the marvelous project could not be promoted without Dr. Omura’s initiation of the collaboration, his discovery of producing strain of avermectin and the following organization. Thus, he has grealy contributed to health and welfare of people through the discovery of useful microorganisms and metabolites which are produced by them.